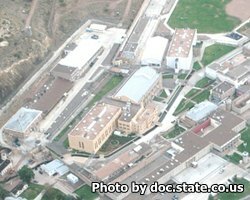 Colorado Territorial Correctional Facility is located in West Canon City. It can house over 900 inmates of mixed custody levels. The facility also currently serves as an intake, processing and transportation unit, and currently has two medical infirmaries. This facility offers a variety of educational and vocational treatments for offenders. One of the working operations of the facility is the manufacturing of state license plates. Inmates can also work in janitorial, barber and culinary programs. Educational programs include adult basic education and courses to help inmates earn their GED. General Population visiting is on Fridays 12pm-3:30pm, Saturdays and Sundays 8:30am-3:30pm. Infirmary Hospice unit has visitation daily from 1pm-3pm. Infirmary unit non-hospice has visitation on Fridays 8:30am-10:45am, must be there 30 days to be eligible for visits.